The English stone cottage is a great example of vernacular architecture. The stone cottage is made from stones found locally in the region making it blend in so harmoniously with the landscape. Stone was normally used for grander buildings like churches as timber was the preferred cottage building material for centuries. It was only when the great oak forests became depleted and timber rose in price that stone was able to compete as a building material for cottages. You can find the stone cottage in most counties where it was easy to quarry stone. Each region of England has its own style of stone cottage. They will all look a little different in colour and texture due to the type of stone, local traditions and masonry techniques that were used. 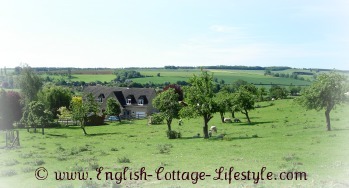 One of the most popular areas to find the English stone cottage is the limestone belt of England which runs from Dorset in the South West to Lincolnshire in the North of England. Limestone is one of the most desired building materials it is easy to work with and can be used to create fine detail. The finish is smooth and it is a beautiful colour ranging from golden honey when straight out of the quarry to a grey when a little aged, it also changes to a soft honey blonde colour in the sunshine. One of the most important areas of the limestone belt, as far as the English stone cottage is concerned, is the region of the Cotswolds. In this area the limestone belt creates a stone which is an ideal building material and produces a generous supply of stone a few feet from the surface making it easy to quarry. The Cotswolds with their gentle, sweeping Wolds or open hills cover six counties; Gloucestershire, Worcestershire, Warwickshire, Oxfordshire, Somerset and Wiltshire. It is here especially in Gloucestershire; the heart of the Cotswolds, that you will find beautiful picturesque villages and cottages all made of local honey coloured limestone. The Cotswolds is a great example of stone building at its best. Everything from the Market halls to Manors to Cottages were built in the same style with the same stone. The local traditions of masonry were passed down normally from father to son, it is here that you will see some of the finest craftsmanship in English stone cottage building. In northern England where the climate is harsh stone is the preferred material for cottage building but not until late into the seventeenth century. They are mainly built from millstone grit found in the region of the Pennines or they are made of red sandstone. The walls are usually two feet thick. Their charm is in their rustic beauty which works well with the bleak atmospheric Northern landscape. In south west England Cornwall has stone cottages made of grey granite The east side of Devon is granite country especially in the Moreland district of Dartmoor. Granite is hard to work and before tools were available the cottages would be made of large stones fitted together to a thickness of about two feet. Walls could be made of rubble or moor stone. They would then normally be whitewashed over. In Dorset you can find small limestone cottages. All these English stone cottages have a strong quality about them. They are small and rugged. You can even find cottages made of sea or river stone. For the main part the south west region of England is cob and thatch country. In the counties of Kent and Sussex and the region of East Anglia you will find the chalk lands of England forming the “Downs“ in southern and eastern counties. Chalk is a while, soft, earthy limestone a spectacular example of chalk can be found on the coastline in the “White Cliffs of Dover“. In the region of East Anglia and the counties of Kent and Sussex you will find excellent examples of flint combined with brick and stone used in English stone cottage building. 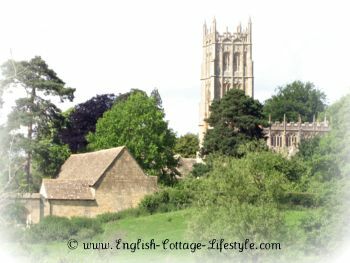 You can find English stone cottages in most counties of England the ones I have mentioned are the most popular. As with anything, beauty is in the eye of the beholder. You may need to travel around England and see a few cottages to find your favourite area. This is easier said than done! If I had to pick my favourite stone cottage destination it would just have to be the Cotswolds. I may be biased as this is my neck of the woods being a Worcestershire girl. The beautiful village of Broadway in Worcestershire rests in the Cotswolds and is well worth a visit. Photo: Castle Combe in the Cotswolds if you like the Francis Frith photo above go to old photos to see more. The Cottage Homes of England. By Lydia Greeves and John Miller.